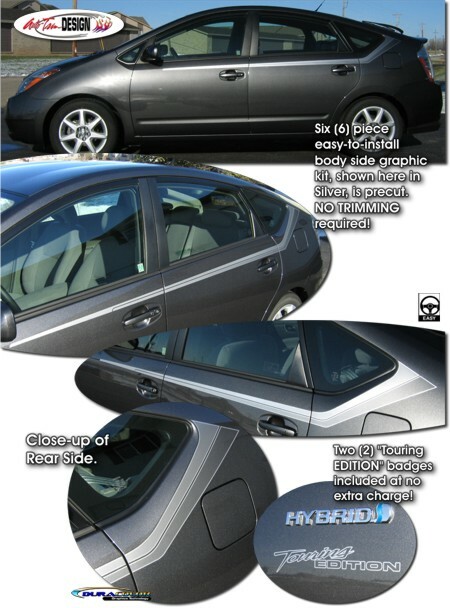 Being "Green" can be even more stylish with our unique and cost-effective body side graphics kit designed specifically for the '04-Current Toyota Prius. Kit is available in four (4) print colors (Silver Fades shown). Very easy to install, this kit is precut - NO TRIMMING required - and is set to be placed along the Prius's distinct upper body line as shown. Two (2) 6.5" (16.51cm) wide "Touring EDITION" badges (same color as graphic) are provided with the kit at not extra charge!